It’s a few minutes after 7 a.m. in Long Beach. The city is awake but just barely. It’s still stretching and yawning and putting the coffee on. 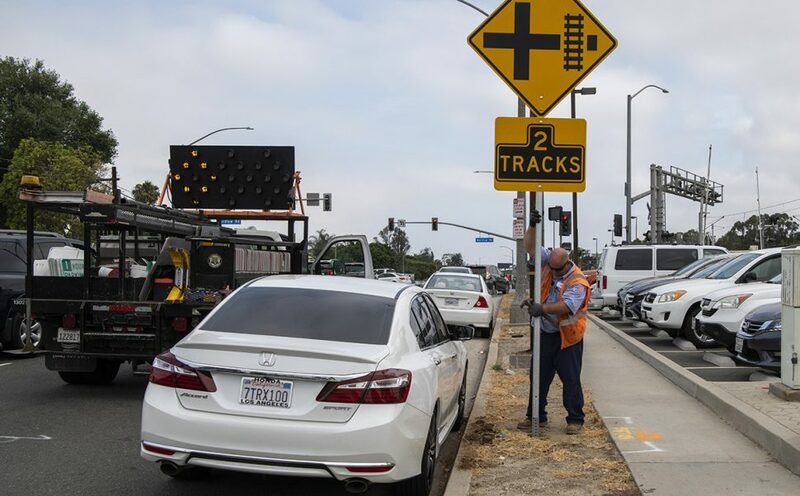 But Jim Danno, of the Long Beach Public Works Department, is on his hands and knees in the Pike Outlets parking garage, holding an electric grinder that’s screaming heavy-metal racket at a signpost anchor, a fountain of sparks reflecting in his dark safety glasses. There are signs of Danno all over the south half of the city. 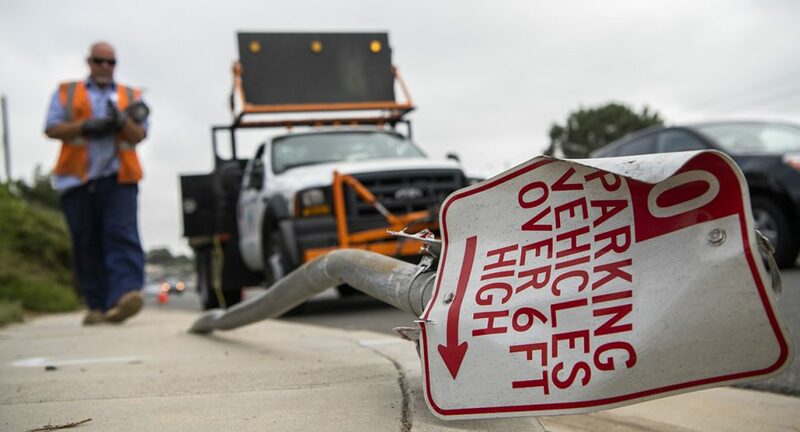 He repairs, installs, cleans up and otherwise maintains city signs, roughly 100,000 of them in his half of the city, a territory that stretches from just east of the 605 Freeway to the Terminal Island Freeway, between Wardlow Road and the Pacific Ocean. 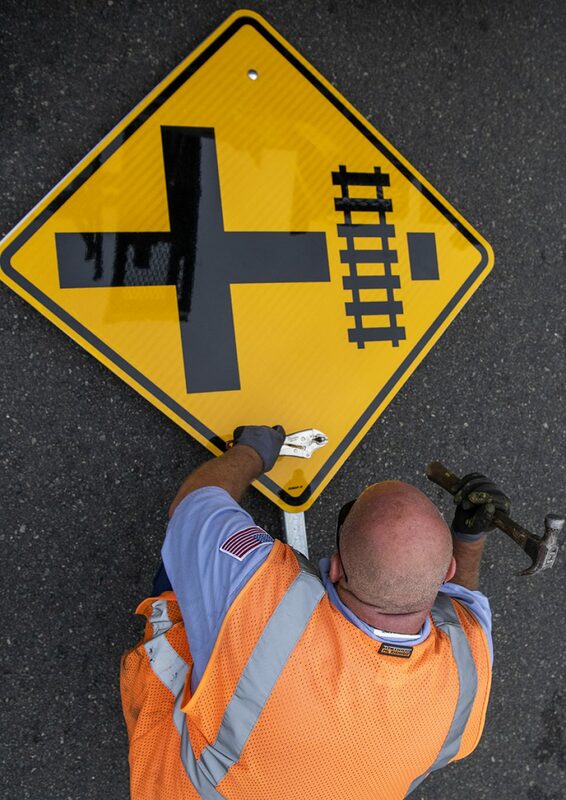 Another worker does the north half of the city, and a third person does installations and repairs of the higher signs, such as the ones that stretch out over intersections. Until you go for a ride with Danno, you might not realize the incredible variety of signs in the city. Sure, there are street signs, no parking signs, street-sweeping signs; signs telling you to merge or yield or that it’s OK or not OK to make a U-turn. There are definite problem areas in town for the sign-fixer. Fourth Street’s Retro Row is notorious for stickers from bands and skaters who cover signs with them. Danno’s truck is loaded with hundreds of signs, mostly the kind that are familiar to most drivers. “I carry at least three of each of the city’s emergency signs,” he says. “Stop, Yield, One Way, Wrong Way and Do Not Enter.” Many of the signs deal with street sweeping. But there are some weird ones, including one Danno was off to install after dealing with the Pike Outlets garage sign. “Is that really useful information?” I ask Danno. He shrugs and smiles. “I just put ’em up.” He lifted a jackhammer out of his truck and, with plenty of difficulty, manages to pound a three-foot-long anchor into the dirt in an area already cleared and marked off by the utility companies, with different colored spray-paint markings showing him where it’s OK to hammer the signpost without hitting something useful or dangerous: Yellow paint for gas, red for electricity, blue for water and orange for fiber optics. Efficiency often determines how he spends his day. “I go into the office at 6 a.m. and get my assignments. Usually 10 or 12. A lot of them come from the GO Long Beach app, and we get some from council members responding to their constituents. But if I get an emergency, I’ll head out to take care of it and then while I’m there I might see two or three other signs nearby that need replacement.” He’ll replace up to 30 signs before his day is over. And it’s not always just taking down a sign and throwing up a new one. It’s not even 8:30 in the morning and already he’s grappled with a Sawzall, a grinder and a jackhammer. And now this pole that’s been knocked flat by a late-night driver. Danno has to fire up the grinder again to cut the pole from its anchor and then get concrete out to apply over the stub so someone doesn’t mess up a foot kicking it. He can’t put in a new pole until, once again, he gets clearance from the utilities. 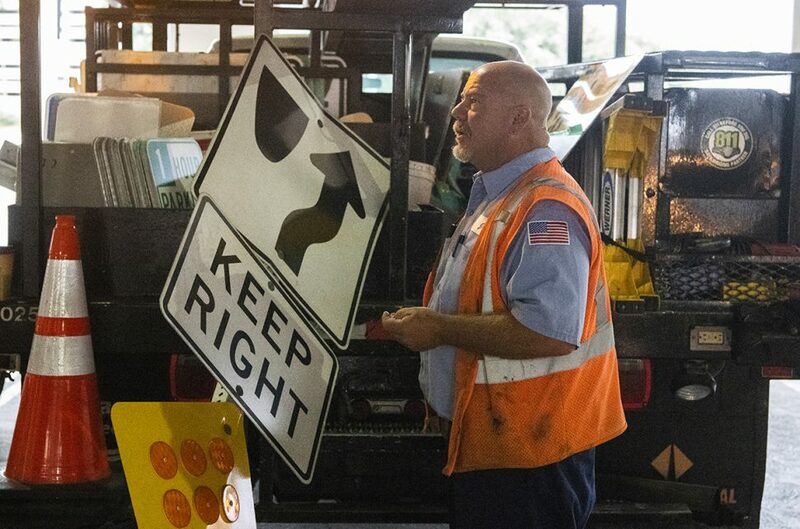 Jim Danno, Long Beach Public Works, is responsible for 100,000 street signs in Long Beach.